Purina Pro Plan OptiDigest Grain Free Medium & Large Adult Dog Food is a complete and balanced formula developed for dogs with a sensitive digestion. 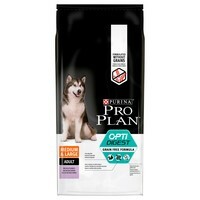 Made with a specific blend of nutrients for digestive health benefits, Purina Pro Plan OptiDigest Grain Free is easily digestible and contains prebiotics for a better gut microflora. The grain free recipe also replaces grains with cassava and other key ingredients for energy and good digestion.